Hello, fellow nature lovers, and welcome to World Watch. I’m Edward Price, and today we’ll be looking at the elusive Wormius Fisticuffius. Once a small-but-incredibly-brutal genus of worm, the species has undergone a breath-taking evolution unlike anything we’ve ever seen before in nature. Once a rigidly militant and familiar-looking faction, Wormius Fisticuffius has mutated into four distinct forms, acquired more tactics and methods with which to dispatch their foes, and Team17, avid keepers of the invertebrate, have seen fit to release them on to the unsuspecting public once again. As an avid fan of the series, I found myself spending the months after E3 quietly anticipating Worms: Revolution. After a period which saw the series retread its third-dimensional roots and make a foray into the world of golf, the pink destructors are finally back to doing what some would say they’re arguably best at – firing explosives at each other and inanely repeating humorous stock-phrases. Those wondering why the word ‘revolution’ has been suffixed to the title if it’s returning to its roots should read further, and perhaps mediate on the concept of patience. After seventeen years of carnage, Team17′s latest outing brings with it the most significant changes to the formula since the aforementioned forays into three dimensions and sport, with the pink invertebrates now affixed to a 2.5D perspective, a class system, a raft of new weapons and a celebrity voice-over. The first of those changes is by far the most significant as, while the action takes place from the traditional 2D stand-point, the worms, the environment and the havoc they wreak upon it are all rendered in three dimensions. Far from being just a cosmetic change, this set-up allows for tighter physics and actions carrying an extra weight that makes the combat feel meatier and more involving. The level of strategy deepens with the addition of destructible objects scattered around the landscape, once woven into the stages as additional cover, now potential avenues of doom for your opponents. Each item will affect the battlefield in a different way once destroyed, from poisoning nearby foes, setting the surrounding area ablaze, flooding it, or simply leaving a crater in the ground, and it’s even possible to use them to crush enemies to death. On top of the strategic revelry that comes from the environmental hazards, the water that has plagued worm-kind since the last century has gained an extra level in ‘lethal’ with its inclusion as a selectable weapon, and the threat of a watery grave has become far more commonplace as a result. The deadly liquid can be used to cleanly sweep enemies off of the stage, carry mines across the battlefield and slowly drown anyone unlucky enough to be submerged. Some stages lend themselves to the use of water more than others, and it means that there are no comfortable places to hide away on the battlefield anymore, as dark-siding (hiding away and playing defensively) becomes a less suitable tactic when the threat of drowning looms ever-present. Any submerged worms will lose increments of health over every turn, regardless of if they’re in play or not and find it harder to escape thanks to the heavier gravity. It’s a very real possibility that your troops could end up drowning in a crater with no obvious means of escape as their life-force ticks steadily away, and some of my most intense fights have come from futilely attempting to wipe out the other side before my remaining worms meet a watery grave. Your side isn’t just restricted to four units identical in all but name, as Team17 have introduced a class system that now means you’ll be scratching your head pondering what to do before you’ve even entered the match. Numbering four in total, the classes are actually fairly typical, and slightly disappointingly so. Your potential line-up can include the standard soldier class we’ve known for decades, the tiny, feebly-hitting scout, the thuggishly-demeanoured heavy and the disproportionally-lobed scientist. Scout class worms are meant to be used for hit-and-run scenarios, quick retrieval of items and provide a smaller target to hit, but are knocked for six far more easily and become an utter ball-ache to deal with should they choose to dark-side. Heavy worms pack a bigger punch, but the trade-off is a pathetically-slow movement speed and jump height, as well as a bigger target for the other side to aim at. This leaves the scientist class, who sacrifices some strength for the ability to heal all of your team, and although the amount may seem pitiable at first, it negates the amount of damage taken from being submerged and can become a serious problem for the enemy to reckon with if you’re kitted out with a whole team of them. While I do love the additional tactical element that arises from the class system, I did find myself dropping the heavy and scout classes fairly soon after adopting them, as they didn’t suit my play-style and I found their disadvantages to outweigh their usefulness; a single advantage seemed marred by multiple handicaps that meant I couldn’t acclimatise myself to using them and would often see them give death-quips before the battle was over. The scientist class felt like it had a greater level of balance and tactical range than the heavy and scout could afford, and so were more likely to roll out onto the battlefield as a result. Making decisions as to your squad line-up is more difficult when you’re not given a choice of what formation you’d like to pick going in to each mission; decisions have to be made in the customisation options several menus away, so you often won’t be able to gauge how effective your squad is until you’re part-way through a skirmish – it’s less about being a quick ponder as to how you will approach each battle and more of a finicky extra step that’ll disgruntle those trying to hone their team to perfection. You won’t be able to just roll out with a squad full of scientists in your first foray – with only the soldier class being available from the start – as the scout, scientist and heavy classes need credits to unlock, and the amount needed increases with every extra worm in that class you wish to acquire. To generate the credits needed, you must venture into the single-player portion, which comes in two flavours: campaign missions and puzzles. Both take place in one of four landscapes, spend their opening levels teaching you how to play the game and come voiced by Garth Marenghi’s Darkplace, Snuff Box and IT Crowd star Matt Berry. Playing the role of a nature documentarian, his booming voice near-perfectly complements the tone of the Worms series and provides the bulk of Revolution’s humour – there’s a wonderful absurdity to a documentary maker discovering a new species of animal and encouraging its members to fight to extinction. Unfortunately, and it’s heart-breaking to say, but he either needed more time and/or direction in the studio, as there’s a worrying percentage of his lines that are delivered in a way that sounds like he was either reading the lines for the first time or racing his way to the pay-cheque. I came across more instances than I’d have liked where the delivery jarred uncomfortably or killed a potentially-hilarious joke, and it put a dampener on the atmosphere that Revolution seems too keen to maintain. This isn’t the only issue with the single-player experience, as while Team17 clearly meant well, it’s an unavoidable fact that, should you choose to play the puzzle mode as well, you’re willingly committing yourself to learning how to play the game three times. 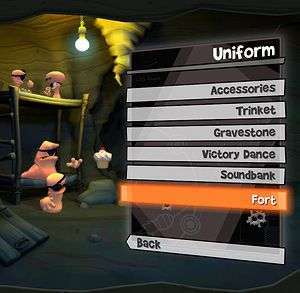 Upon starting Worms Revolution for the first time, you’ll be thrust into a playable tutorial that does well to clue new players in and ease them into the controls, and while it originally felt like a great touch, it eventually felt unnecessary after both the mission and puzzle mode spent several levels slowly introducing the new mechanics in a way that came across as slightly patronising after being told how to do everything at least once more than was necessary. It betrays the true quality of what players will eventually come up against, and the puzzle mode alone will throw some serious head-scratchers your way soon into the second setting and is ideal for occasionally dropping into. The campaign also starts off in a deceptively-paced manner, but then rockets off into the distance shortly after the halfway point. Most of the scenarios after the sewer stage are just death-matches on custom-made stages, and to Team17′s credit, they don’t feel like they’re an extended tutorial for the multiplayer. However, the second half of the game has a difficulty spike rather than a difficulty curve, and it can feel like the odds are stacked just a little too unfairly against you. This is exacerbated by one major issue all Worms titles have been blighted by since the days of the Amiga – the AI is a complete crap-shoot. Missions where the player has to square off against twelve(!) 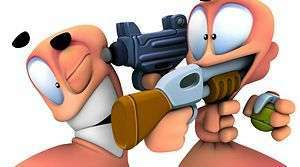 enemy worms can feel like hopeless missions when they’re at full health, let alone when they can snipe you across the map with a shotgun and pull off trick shots that’ll inspire little more than a tirade of swears. There’s also a tendency for the AI to start freaking out if it becomes trapped under the destructible scenery, but this is far less common than it managing to throw that grenade across the map just when you’re on the cusp of victory. It’s just a shame that, despite the raft of changes that make Worms Revolution a more involved thinking man’s game, it can still be undermined by erratic and unconvincing AI even after nearly two decades. Once you’ve tired of the AI or have played enough to unlock your ideal squad then you can take the fight to some more humanoid opponents, namely some actual humans, and this is where the series has always shone brightest. Indeed, this is where Worms Revolution is at its best – every single change, every minor permutation, comes good and provides Worms, but not quite as we know it. There’s the option to play in a classic mode that reverts all of the changes and gives you a more authentic experience, but to do so would be an utter disservice to what Revolution can achieve. The dynamic of play becomes as complex or simple as you will it, and every battle becomes unique in its own right through just one of the new addition, let alone them all put together; even a minor change like replacing a single soldier worm with another class can be a complete game-changer. Couple in the level editor that allows you to finely craft landscapes or create randomised masterpieces and you realise that Team17 haven’t just refined the formula, they’ve given it a vital longevity and a blueprint for the future. 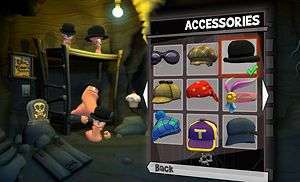 Worms: Revolution certainly isn’t the most flawless title around; it’s still haunted by AI issues and flaws that have plagued the series since its inception, fall damage is too easy to pick up, the single player takes too long to get going, Matt Berry is underutilised and delivers an occasionally-disappointing performance, the class system needs some refinement and re-balancing, and the customisation feels oddly lacking in comparison to other titles in the series (and the sound-bank quotes are spouted so often that you’ll find yourself back in the customisation menu more often than you’d like). Yet, taking into consideration everything that it does right, what you have left is the most refined Worms to date and a title that not only proves there was still plenty of life in the formula, but that there’s scope for the series to go even further in future. 2.5 D Perspective, destructible objects and use of water add even more strategy than before. Class system is a great step in the right direction. Sets blueprints for the series to go even bigger and better in future. Matt Berry's performance is underwhelming and underutilised. AI can still be wildly erratic and frustrating to deal with. Teaches you how to play the game three times. While Worms: Revolution isn't going to set the world ablaze like its industrial or renaissance counterparts, it keeps a decades-old formula feeling fresh and entertaining. What it does do similarly to its historical namesakes is lay the framework for even greater things to come, and thus Worms: Revolution isn't always about what it does right, but what it does for the future of the series. Back in the present, you’re left with a fun - if occasionally frustrating and flawed - title that you’ll soon find yourself coming back to time and again when friends are involved. It’s the deepest, funniest Worms to date, and proof that there’s plenty of life in this beast yet.